NEW LOWER PRICE! Now Save $170 Off MSRP! Product information "HAIX Airpower R200"
Flex Protection System: Leather reinforcement over the heel bend which protects this softer and more flexible leather from chafing. Anatomically formed and well-padded steel protective toe cap. Oiled nubuk leather, waterproof, hydrophobic, and breathable. 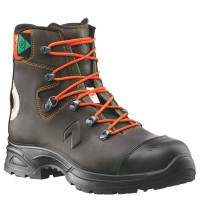 GORE-TEX footwear, 4 layers with inner Cambrelle lining, abrasion resistant, softly padded with functional non-woven fabric. Waterproof, breathable, and chemical resistant. Rubber/PU sole with robust street tread, superior bending comfort, wear resistant and non-slip traction in cold weather; lowweight PU, impact absorbing wedge ensures outstanding walking characteristics. Heat, oil and gasoline resistance with non-marking characteristics. Non-woven footbed absorbs sweat and moisture. Integrated heel bend, low friction lacing elements, TPU toe cap, no side seams, and reinforcement in the toe area. Related links to "HAIX Airpower R200"
Customer reviews for "HAIX Airpower R200"
Thank you for your feedback on the Airpower R200. We are happy to hear that you like the fit and feel of the boots. We pride ourselves on excellent customer service, so we are so glad that you had such a good experience, even comparing us to Amazon. What a compliment! 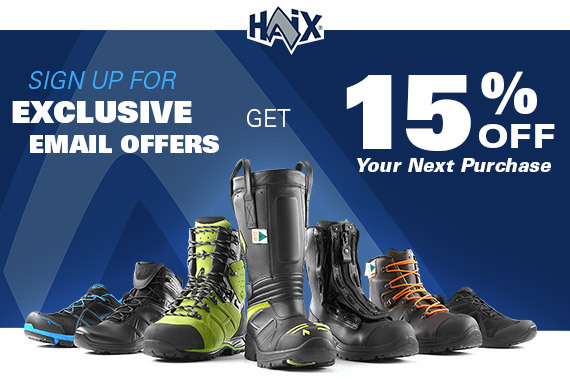 We hope you will remain a loyal HAIX customer in the future! I've worked for a Railroad for 24 years and cut my own firewood for 16 years. These are the best work boots I've had yet,this pair is my 3rd (same style r200) in 6 years. I only purchased this pair because they were so cheap....$99.00 Come On!! You WON'T find a better boot at that price!! Thank you so much for taking the time to review the R200. We are happy to hear that these are the best work boots you've ever worn. We are also pleased to hear that you like the price of this boot. Just to let you know, this boot is being discontinued and we're only selling what we have left in stock. So if you order another pair in the future, you may want to consider the XR200. We appreciate your service and your loyalty to HAIX! Great boots!! I bought a pair of r200 series several years ago. I didn't buy them directly from Hiax,so I think that they were seconds because the tongues never stayed straight and some other minor issues. The boots were still great and lasted about 3 years until they came apart and I bought new ones directly from Hiax. I've had them for about 4 months now and they're holding up great. I haven't had any of the issues that I had with the old ones. I highly recommend them,I've been working for the railroad for 23 years,cutting firewood for 15 years and doing all kinds of work in between,you won't go wrong with these boots! We really appreciate your feedback and are happy to hear that you have had such a good experience with our boots over the past few years. We hope they continue to serve you well in the future. I bought these boots to replace my Danner foreman gtx work boots. The quality and construction of the r200 is outstanding. They fit great out of the box and have held up to 6 months of daily abuse. I love them so much that I ordered a second pair. As a side note the folks at Haix are awsome. I called to find out what insoles I should order as mine are getting a little beat up. They sent me a replacement pair no charge. How often do you run across that with customer service? I'm now your biggest fan, and will be singing your praises to all my friends. Thanks for the great feedback David... And we definitely appreciate having you as a fan! I cant say anything about the craftsmanship of these boots, they are great. I wear my boots sun up to sun down everyday and the are built well. My only problem is the lacing on these new boots compared to air power gold. Either the boot is to tight overall or I have it comfortable but my foot is loose in the boot. I didn't have this problem with the air power gold with are no longer made. It looks like the xr200 has gone back to the side loop in the lacing which I think will help tremendously. For now the r200 will have to work.